A PLL Recap: The verdict is in!!! Hey little liars! To be honest, I’m pretty emotional right now. I’m angry, I’m sad and I’m just in plain disbelief. I mean, sure, we all knew this was coming, but to hear it and see what happened in the last 2 minutes of the episode was just overwhelming. If this is how I’m feeling now, I can imagine how I will be next week when the “big reveAl” happens. 5. Lesli Stone returns to Rosewood as a surprise witness. In case you need a refresher, Lesli made her first appearance in 5×18, claiming to be Mona’s friend from out of town. She reveals to the girls that she talked to Mona the night before she died and heard a male voice yelling at Mona, which we found out later was Mike. Let’s just say, Mike and Lesli didn’t have a good impression on each other. During, the trial Lesli brings a piece of evidence, a little card mentioning Alison’s threats. It doesn’t make anything better for Alison. Lesli then proceeds to throw Hanna, Mike and the girls under the bus, stating that they were all hiding something. She claims that Hanna was stalking her and Mike “practically attacked” her, which is sort of true, but still, this girl came out of nowhere. Either this was all part of Mona’s grand scheme or Lesli is working for “A”. 4. Alison takes the stand. The whole episode, Spencer, Emily and Aria are working to find someone that can be Ali’s alibi. We flashback to Thanksgiving where Ali is at the park waiting for Cyrus. She doesn’t see anyone, but she does hear someone. Due to some amazing detective skills, Emily and Spencer find this person by seeing a certain scarf/patch. However, the girl who was at the park doesn’t get them anywhere as she was recovering from partying too hard the night before. This dead end causes Alison’s lawyer to use their own surprise witness…Alison. 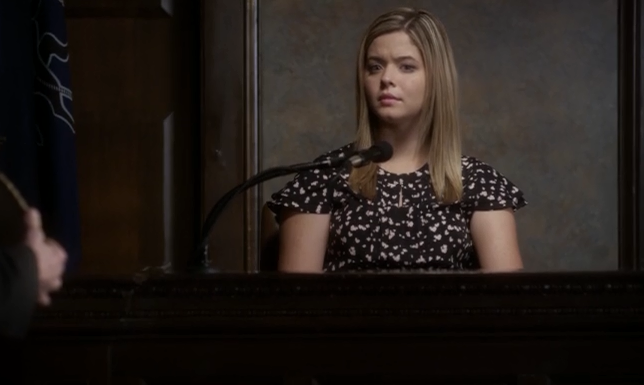 Ali’s lawyer brings up the point that Alison fractured her elbow when she was little and it never healed. What does that have to do with Mona’s death? The force used to push her around. I thought this was making a good case until the prosecution dug up some old archery award. Alison says nothing about it. After the jury goes into deliberation, Alison reveals that she convinced her bunkmate to help her rig that archery competition. It looks like she didn’t want to open up a can of worms mentioning her old bunkmate, whoever it was. 3. Ezra vs. Caleb over Mike. Honestly, I was getting pretty frustrated with Aria. I understand she wants to protect her brother in all of this, but I think Mike was looking at the bigger picture when he wanted to confess everything he knew if he was called to the stand. As Aria enlisted Ezra’s help to take Mike away from all the madness, Caleb wanted Mike to tell his side of the story. Ezra and Caleb got in a pretty heated argument about what Mike should do, but during all their bickering, Mike drove off. He didn’t get too far as he was attacked by a pretty skilled archer, knocked unconscious and tied around a tetherball pole. 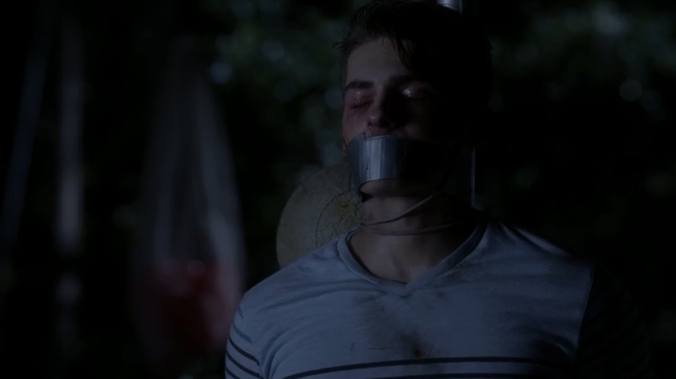 Ezra and Caleb were successful in getting past the mysterious archer(s), and rushed Mike over to the Rosewood police, but not before taking a photo of his binding situation. And while I thought that this proof and Mike’s state would be some good evidence, apparently it wasn’t, according to Detective Tanner. To me, she basically implied that the whole attack on Mike was staged to try to get the girls off the hook. Detective Tanner is either working for “A” or the whole Rosewood Police Department is in denial. If Aria allowed Mike to tell the truth, I think the whole thing could have been avoided or at least put off for a little longer. 2. Andrew reaches another level of creepiness. Andrew gets very defensive when he hears that Aria recruited Ezra for help regarding Mike. He’s gotten to be a stage 5 clinger and obviously he’s jealous of Ezria’s relationship. He keeps repeating his “I’m here for you 24/7” spiel to Aria, but the one time she calls him for help in looking after Mike, he’s not available. And it happens to be when Mike goes missing. Later on during the trial, he meets Aria to apologize. Somehow a yearbook quote is worked in the mix and Aria finds out that Andrew was a Pathfinder Scout for 12 years. Um…Ezra, Caleb and Mike were attacked at the Pathfinder Scout camp the night before. “A” is for Archer Andrew. 1. #AlisVerdict & the arrest. Remember when I was ranting earlier? Well, this is why. Again, I think the majority of us knew the jury would find Alison guilty, but to hear it and to see it was heartbreaking. Sure, Ali’s done some unforgivable things to a number of people, but for her to go to jail for a murder she didn’t commit had me feeling all kinds of emotions. The evidence and testimonies didn’t help Alison at allOne thing that made me angry was the reactions from people behind the girls who were in distraught seeing their innocent friend get a verdict, landing her life in prison. Everyone behind Emily, Spencer and Aria were all smiling. I was sitting here playing the scene back, thinking, “YOU ALL DON’T KNOW WHAT’S REALLY HAPPENING HERE, SO STOP SMILING.” Maybe if Mike actually testified, it would’ve changed something. But “A” is always one step ahead. Anyways, after Alison’s heartbreaking verdict, Tanner finally made an appearance at the trial to gloat and to arrest the remaining “liars”. Officer Toby was too late to save them and Tanner had all the evidence she needed to land them in jail with Alison and Hanna. I also dislike the fact that she was conveniently there to arrest them right after Alison’s verdict. Since all of them are in jail now, I wonder how their dynamic will change and what games “A” has up their sleeve. I guess we’ll find out next week along with who “A” is. Theory of the week: As I was writing the bit about Andrew earlier, I came up with a theory. Apparently, there have been talks about there being a twin in the mix, that’s not Alison’s. In case you missed it earlier, Alison’s past came up about camp when she was 11 and her convincing a bunkmate to rig the game of archery for her. Maybe that’s where it all started? We all know Andrew gets pretty competitive and may have some great archery skills, so maybe Andrew has a twin sister who is very similar! Who knows!? That’s it for this week, liars. You know what to do! Like, share, & comment. Let me know what you thought of tonight’s episode and share some of your theories! This entry was posted in Entertainment, Pretty Little Liars, Recaps and tagged A, ABC Family, Alison DiLaurentis, Aria Montgomery, Caleb Rivers, Emily Fields, Ezra Fitz, Mike Montgomery, PLL, Pretty Little Liars, recap, Spencer Hastings, television, Toby Cavanaugh on March 17, 2015 by Adele Fredeluces.